FRISCO, Texas (Feb 15, 2016) – US Youth Soccer experience is a common thread among the 2015 Fall Gatorade State Players of the Year for high school soccer. Of the 56 players chosen, 51 have played in the US Youth Soccer Olympic Development Program, National Championship Series or National League. Two of those players, Marykate McGuire and Michael Deshields won the 2014 US Youth Soccer National Championships in their respective age groups. McGuire, who is now a two-time Rhode Island player of the year, won the 2014 National Championship with NEFC Elite (MA) after the team finished third in the 2013 National Championships. McGuire led all scorers on the girls side with seven goals in five games; a performance that landed her the Golden Ball award, given to the most valuable field player. Deshields, who was named the Maryland player of the year, claimed the 2014 National Championship with Baltimore Celtic 97/98 (MD). Deshields and his Celtic teammates have claimed a pair of US Youth Soccer Maryland State Cup and US Youth Soccer Region I Championships titles, a 2014-15 National League Red championship and a semifinals appearance in the 2015 National Championships in just a handful of seasons in US Youth Soccer events. Pennsylvania player of the year, Evan Vare, reached the National Championships in 2013 and 2015 with Lehigh Valley United 97 (PA-E) and is the only team in the Under-18 Boys age group to have already earned a spot in the 2016 National Championships, due to a first place finish in the 2015-16 National League Blue division. Vare also competed in the 2014 US Youth Soccer ODP Championships, where his Eastern Pennsylvania side reached the semifinals. In total, 32 state players of the year have participated in US Youth Soccer ODP. Virginia player of the year Nate Johnson and Connecticut player of the year Jenna Bike, round out the players of the year who have reached the National Championships. Johnson’s Arlington Impact (VA) squad won the 2014-15 National League Red division and reached the finals of the 2015 National Championships. Bike won the 2013 Region I Championships with Connecticut FC (CT) and finished tied for second in her group at the 2013 National Championships. 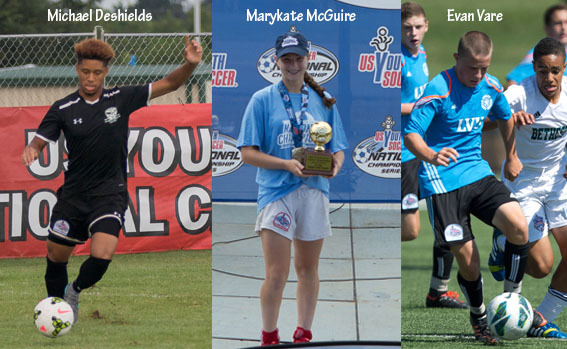 Multiple players of the year have experienced deep runs in one of the four US Youth Soccer Region Championships. Below is a list of players who have reached or surpassed a regional semifinal.